V2 vs. V3 product positioning. 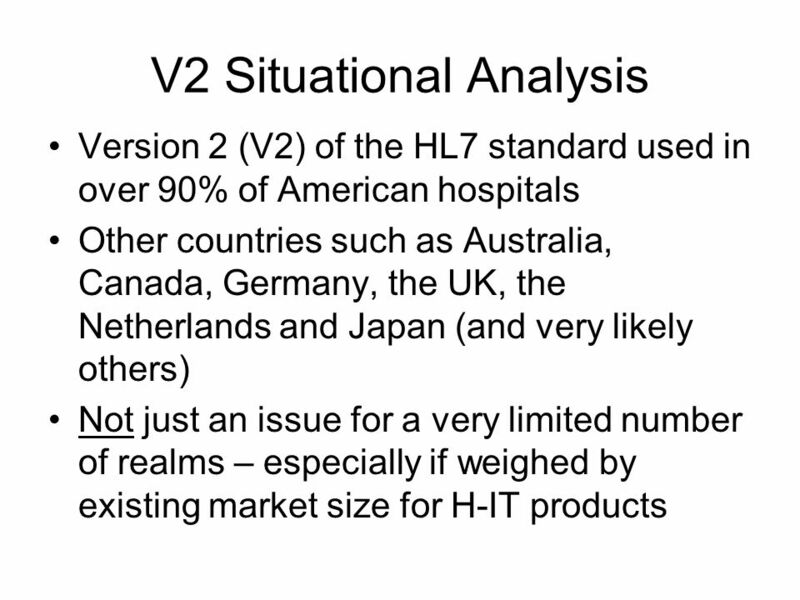 V2 Situational Analysis Version 2 (V2) of the HL7 standard used in over 90% of American hospitals Other countries such. 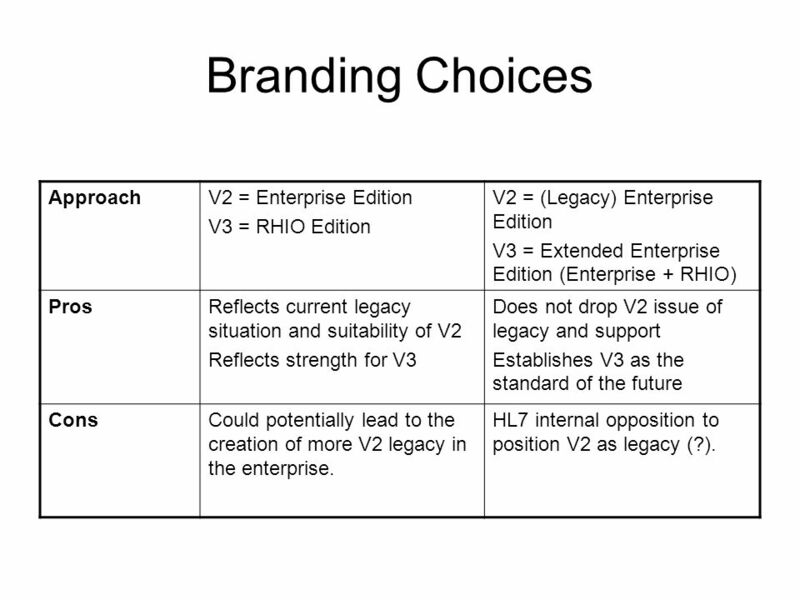 5 Branding Choices ApproachV2 = Enterprise Edition V3 = RHIO Edition V2 = (Legacy) Enterprise Edition V3 = Extended Enterprise Edition (Enterprise + RHIO) ProsReflects current legacy situation and suitability of V2 Reflects strength for V3 Does not drop V2 issue of legacy and support Establishes V3 as the standard of the future ConsCould potentially lead to the creation of more V2 legacy in the enterprise. 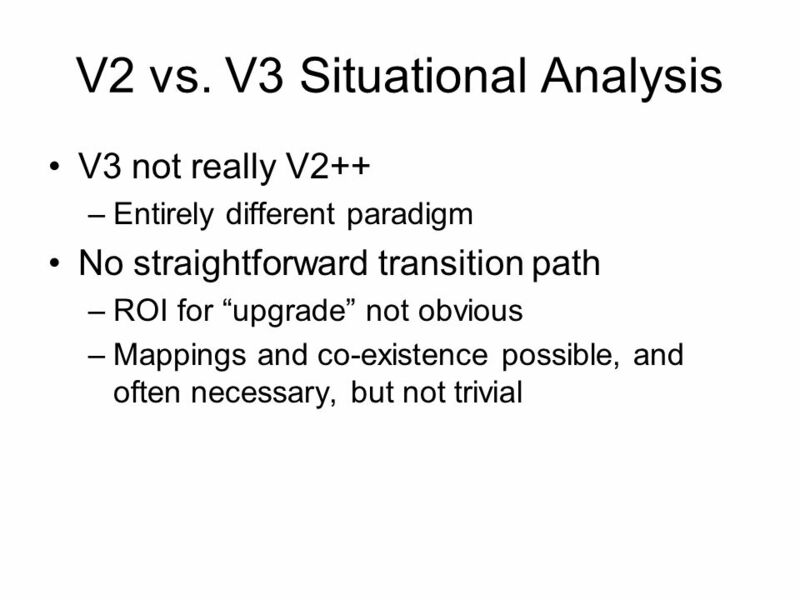 HL7 internal opposition to position V2 as legacy (?). 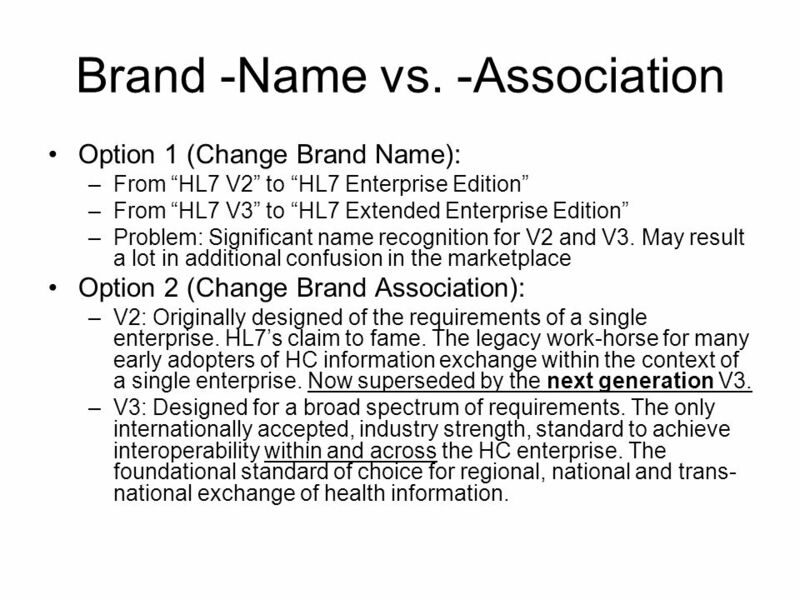 6 Brand -Name vs. -Association Option 1 (Change Brand Name): –From HL7 V2 to HL7 Enterprise Edition –From HL7 V3 to HL7 Extended Enterprise Edition –Problem: Significant name recognition for V2 and V3. May result a lot in additional confusion in the marketplace Option 2 (Change Brand Association): –V2: Originally designed of the requirements of a single enterprise. HL7s claim to fame. The legacy work-horse for many early adopters of HC information exchange within the context of a single enterprise. Now superseded by the next generation V3. –V3: Designed for a broad spectrum of requirements. The only internationally accepted, industry strength, standard to achieve interoperability within and across the HC enterprise. The foundational standard of choice for regional, national and trans- national exchange of health information. 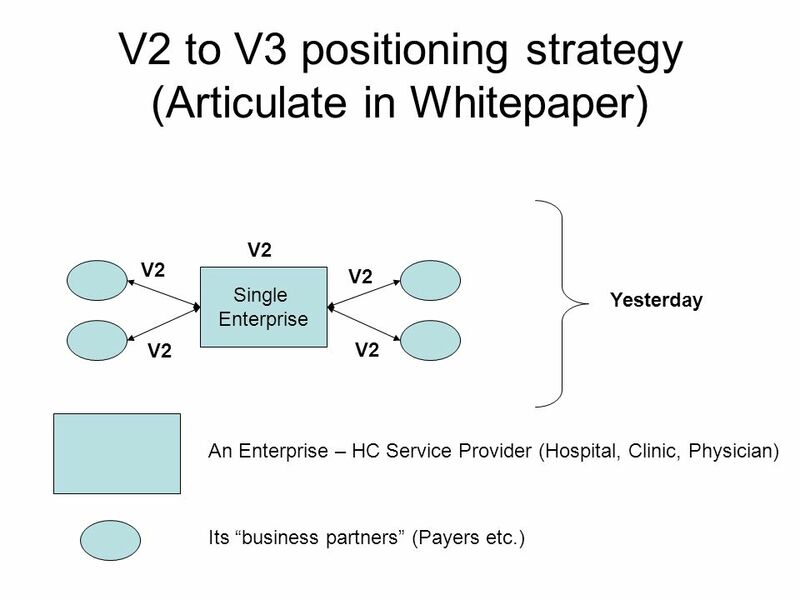 11 V2 to V3 transition strategy (Articulate in Whitepaper) No more than 4-5 pages. Well not talk about the RIM, well not talk about semantic interoperability. We focus on what it does for you – not how it does it. HL7 in a fortune cookie. Section 1: Healthcare and Interoperability Standards (Intro) Section 2: HL7 V2.0 – the original HL7 success story. Position V2.0 as success for early movers way back when, but also as legacy pointing out its short-comings for the 21 st century (i.e. HL7 is response to the marketplace and its requirements) Section 3: HL7 V3.0 (Intro) - The only internationally accepted, industry strength, standard to achieve interoperability within and across the HC enterprise. The foundational standard of choice for regional, national and trans-national exchange of health information. Section 4: V2.0 and V3.0 mixed environments. How some countries tackle it (e.g. UK, Germany). It is not easy, but it can be done (because it has to be done). Section 5: V3.0 – the standard of the future. Speak especially to the issues of emerging countries and regional networks. Section 6: Short summary (V2 was as success and will be around for some time to come, V3 is the next generation). 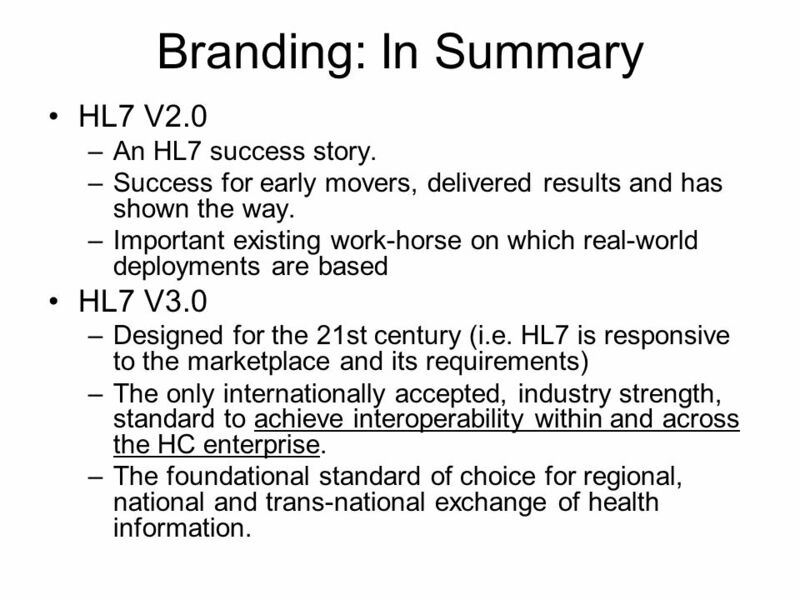 12 Branding: In Summary HL7 V2.0 –An HL7 success story. –Success for early movers, delivered results and has shown the way. –Important existing work-horse on which real-world deployments are based HL7 V3.0 –Designed for the 21st century (i.e. HL7 is responsive to the marketplace and its requirements) –The only internationally accepted, industry strength, standard to achieve interoperability within and across the HC enterprise. –The foundational standard of choice for regional, national and trans-national exchange of health information. 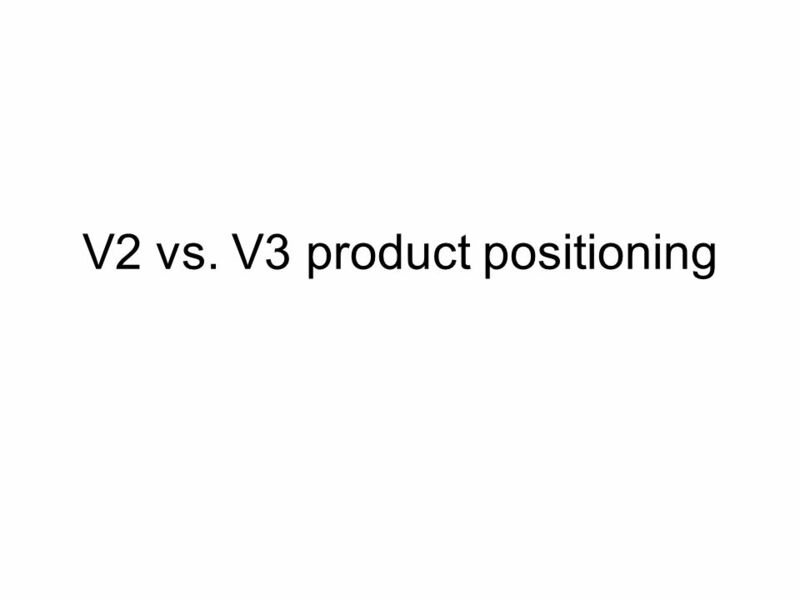 Download ppt "V2 vs. V3 product positioning. V2 Situational Analysis Version 2 (V2) of the HL7 standard used in over 90% of American hospitals Other countries such." EMRLD A RIM-based Data Integration Approach Pradeep Chowdhury Manager, Data Integration. Public Service Reform – from theory to policy? Richard Brooks. Project Background & Aims This research reflects an unique opportunity for a collaborative effort between three leading aged and community care industry. A Model of eHealth Interoperability Craig Kuziemsky, Telfer School of Mgmt, University of Ottawa. James Williams, Community Care Information Management. Prof. Avis C. Vidal Humanities Center Seminar October 1, 2013. Globalization of Mexican Businesses By Arun Kottolli. Quality-Based Purchasing: Challenges, Tough Decisions, and Options R. Adams Dudley, MD, MBA Support: Agency for Healthcare Research and Quality, California. MARKETS IN EDUCATION EFFECTS, IMPACT AND DIVERSITY Alexandre Homem Cristo ECNAIS, Warsaw, November 18th 2011.